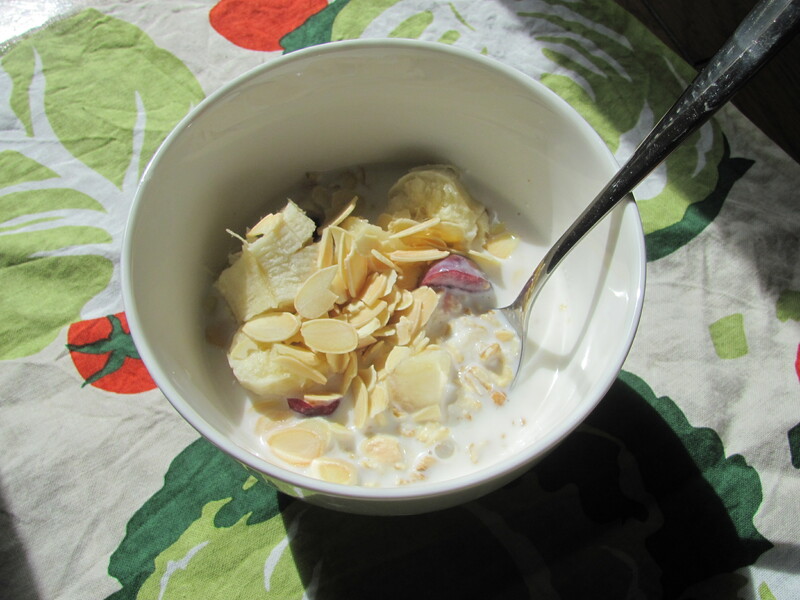 Hot Weather, Cool Kitchen: Overnight Oats – I'll Make It Myself! 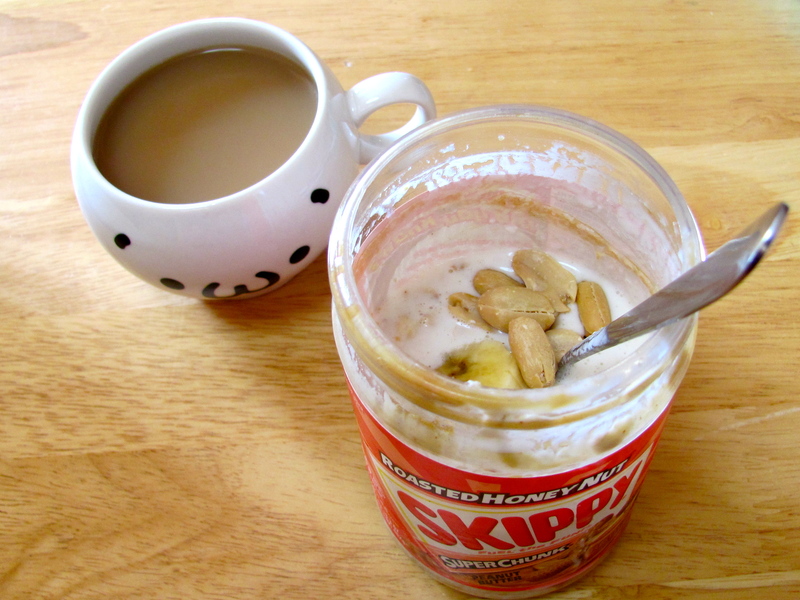 There are two import foods I can’t live without: peanut butter and oats. Let’s talk about oats–I’ll get to the peanut butter later. Sometimes I buy Quaker Oats in bulk from online import stores; sometimes I buy Alishan or Alara jumbo organic oats at Diamond in Omicho Market; sometimes I get Nisshoku oatmeal from the regular supermarket, though I prefer bigger oats. At any rate, there’s a constant supply of oatmeal in my kitchen, which keeps my cereal-obsessed American self quite happy, especially in the dead of the Hokuriku winter when the morning oatmeal warms the kitchen and dining room. But what about in summer? Overnight Oats with banana, cherries, and sliced almonds. That’s where overnight oats come in! It’s like making cold cereal — requires no heat and barely any effort, just 5 minutes before you go to bed! Note: This section has been edited. It’s come to my attention that the OP of the recipe’s blog has a lot of problematic elements that I was unable to see as a new reader and which have escalated severely since I posted this. I grew more and more uncomfortable with the blog during 2012 and unfollowed around the same time a friend sent me smugnom. The recipe is still good, but I can’t believe I followed the blog for several months before I saw it. My getting weirded out by faux-feminist bloggers is also the inspiration for this post. I remember when I first encountered the concept (via Homemade Adventure‘s awesome oatmeal series): using nut-butter jars to make the oatmeal so that last little bit at the end that’s impossible to get with the knife or spoon, and I was immediately incensed. How dare people have fancy nut butter when I have to pay through the nose for imported stuff and can’t find enough peanuts in one place to grind my own?! (I told you I was serious about my peanut butter.) Oh, it must be so nice having access to organic sunflower butter and chia seeds! HOW FANCY. Enough about me and my nut-butter angst! On to the recipe! An easy trick to remember is that you want a 1:1:1 ratio of oats, milk, and yogurt, though you can certainly alter this to suit the size of oats, the consistency of the yogurt, or the desired final consistency of the oatmeal. Stay cool! 1. Mix oats, yogurt, and milk together in the container. 2. Add in any mix-ins (see below). 3. Store in refrigerator overnight. 4. Serve in jar; if making multiple servings, dish out into bowls. I am glad you share my love of oatmeal! Persimmons in oatmeal sounds amazing, I would have never thought to try that! Pingback: Overnight Cold-Brewed Coffee « I'll Make It Myself! This sounds great! I always get major cereal withdrawls and I like oatmeal but not when it’s this hot!! I need to scope out my local grocery for oats again, I know I saw some around town somewhere…This could become a new fave! Thank you! If you’re in Chiba, the big AEON grocery stores often have tons of imported food. I don’t know if you get Meji-ya or Yamaya in the east, but they also tend to carry oatmeal. If you can’t find it in stores for some reason, Foreign Buyers’ Club, Tengu, Yoyo Market, and other online retailers have oats. Enjoy, and thanks for the comment! I went to my local Aeon and bought some this evening! It was 388yen for a 300g bag…but there’s a few other supermarkets that I’ll check next time (I’ve heard the Besia in Cainz is good). I found some slivered almonds on sale, too, so I think it’s meant to be! I’m excited to have this tomorrow morning for breakfast :-) Thanks for the tips! So glad to hear it! I really miss the cold cereal from the US, too, so this recipe really helped make breakfast preparations easier! I do too! The three kinds of corn flakes just don’t cut it for me. Thanks again! Pingback: Overnight Cold-Brewed Coffee | I'll Make It Myself!